Israeli forces had a day of successful air strikes Thursday, killing three senior Hamas officials just a day after the organization claimed responsibility for the kidnapping of three Israeli teens. The strikes targeted leaders of Hamas’s armed wing, the al-Qassam Brigades. According to Hamas, the strikes killed Mohammad Abu-Shamalah, Raed al-Attar, and Mohammed Barhoum, all highly sought by Israeli forces. The IDF initially only confirmed the deaths of Abu-Shamalah and al-Attar, but later confirmed that Barhoum had been killed as well. … These triumphs against the Qassam Brigades leadership came just a day after Hamas’s Saleh al-Arouri claimed responsibility for the kidnapping and deaths of Israeli teens Eyal Yifrach, Gilad Shaer, and Naftali Fraenkel. The target selection sends a big message, too. For the past several weeks, the Israelis had for the most part resigned themselves to a continuing Hamas presence, in part over fear of what might follow in its place. One need look no farther than the northern Iraqi desert to contemplate the answer to that question. Now, though, Israel seems more committed to decisively breaking Hamas rather than the “mowing the lawn” strategy early in this war. The tunnels may have convinced them, or more likely the large plot for a coup against the Palestinian Authority, but either way the specific targeting of top leadership sends a message that Israel has dispensed with worrying about the pessimistic options and now want Hamas out of the way entirely. The futility of the latest round of talks can’t have helped, either. Palestinians have responded to the loss of their militant leaders by developing much more secure, smaller and more secretive leadership structures that cannot be easily penetrated by Israeli intelligence agents. Groups such as Hamas have established more decentralized and localized operational units that continue to function in war or peace if the leadership is hit. More sophisticated command-and-control systems have evolved that don’t rely on a single decision-maker. Support among the Palestinian community for the long-term struggle has increased. And the resistance itself has turned to technologies and strategies — such as rockets and tunnel-building — that are more deeply embedded in Palestinian communities than reliant on the skills or charisma of a handful of individual commanders. One witness said masked gunmen lined up the seven men in a side street and opened fire on them. He spoke on condition of anonymity, fearing for his own safety. Other witnesses told AFP that six of the victims were grabbed from among hundreds of worshipers leaving the city’s largest mosque, by men in the uniform of Hamas’s military wing. They were pushed to the ground. One of the masked men shouted: “This is the final moment of the Zionist enemy collaborators,” then the gunmen sprayed them with bullets. On Friday morning, a Gaza security official said that 11 suspected informers were killed at the Gaza City police headquarters, noting that they had previously been sentenced by Gaza courts. 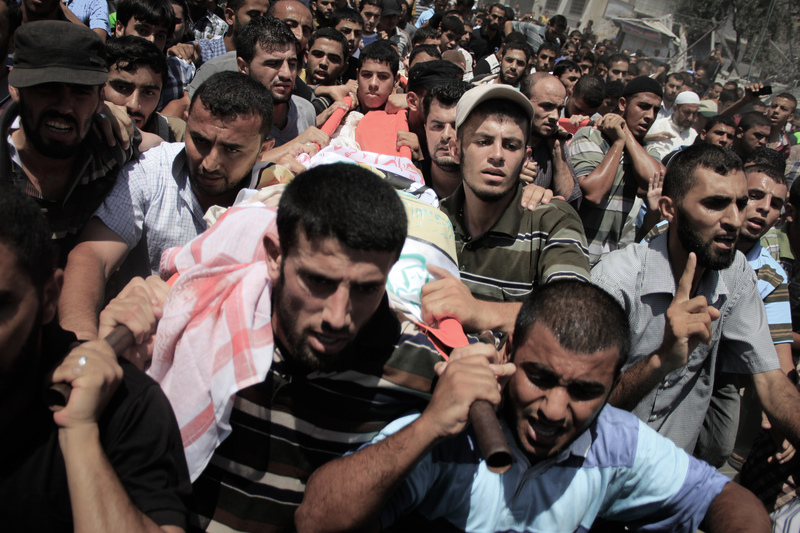 The killings of the first 11 were also reported by al-Rai and al-Majd, two websites linked to Hamas. Previous Previous post: Why Is No One Running Against Hillary?